Edited by Mirjam Fischer and Anna Niederhäuser. With contributions by Volker Albus, Meret Ernst, Mirjam Fischer and Anna Niederhäuser, Claude Lichtenstein, and Renate Menzi. They created Swiss design icons: The Soft Chair (1967), the Cloud Lamp (1970) and the Stack of Drawers (1981). 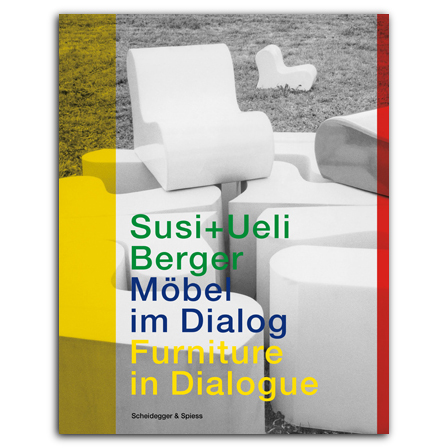 For some forty years, Susi and Ueli Berger’s work has been guided by the credo that “only a new idea justifies a new piece of furniture.” Contrasts between product design and object art, and suitability for everyday use characterize their designs. A playfully provocativeness and the combination of rationality and sensuality are additional hallmarks of the Bergers. Featuring a wealth of previously unpublished original drawings, plans, photographs, and promotion materials, as well as a catalogue raisonnée of Susi and Ueli Berger’s collaborative work and an illustrated biography, this groundbreaking book offers first-ever survey of their life and oeuvre. It is published in conjunction with a retrosepctive at Zurich's Museum für Gestaltung in summer 2018.
, born 1949, is an architect and designer and a Professor of Product Design at Karlsruhe University of Arts and Design. He also works as a curator and is the author of several books and regularly contributes to German-language design magazines, such as Designreport, Form, Hochparterre, or Kunstzeitung. , born 1966, is a lecturer for history of design at the Academy of Art and Design (FHNW) in Basel and design and culture editor with Hochparterre magazine in Zurich. She is a member of the university council of Zurich University of Applied Sciences and Vice President of the Swiss Design Association (SDA). She has also curated various exhibitions on everyday culture, graphic art, and design. , born 1969, lives and works as an independent editor and books producer in Zurich. Following her studies of art and architectural history and modern German literature, she has worked at at the Swiss Federal Office of Culture 1998–2007, as publishing director with Edition Patrick Frey in Zurich 2007–12, and as head of publications at Museum fur Gestaltung Zurich 2014–16. In 2013, she founded her own agency mille pages in Zurich. , born 1949, lives and works as a freelance writer and curator. He graduated in architecture from ETH Zurich and was curator for architecture and design at Museum fur Gestaltung Zurich 1985–2002. He has also taught history of culture and design studies at various Swiss universities. , born 1968, is Curator of the Design Collection at Zurich’s Museum für Gestaltung since 2008. She trained as a product designer and read culture studies in Zuroch, Jerusalem, and Berlin. She teaches, publishes, and researches in the field of design and served as a member of the Swiss Design Commission 1985–2002. , born 1979, is Head of Design Promotion at the Swiss Federal Office of Culture in Bern and also works as a freelance writer and curator. She graduated in art history, literature studies, and history from University of Zurich. She has previously worked in design and art promotion with the Swiss Federal Office of Culture in Bern 2009–12 and as head of administration and projects with Design Center Langenthal 2012–14.